In its 2001 exhibition “Freestyle,” the Studio Museum in Harlem ushered a brilliant batch of emerging artists of African and Latino descent onto the art world’s main stage. To our immense benefit, several more such group introductions have followed, “Fictions” being the latest. Like its predecessors, the show has no overarching theme but lots of connective tissue in terms of forms and ideas. The Studio Museum has always been a showcase for figurative painting, and continues to be with Christina Quarles’s surreal picture of mantis-limbed lovers; Amy Sherald’s pair of grave, graceful somnambulists; and Devan Shimoyama’s enchanted painting of a queer-style barbershop shape-up in progress: the sitter has gold skin, plastic flowers for eyes and weeps rhinestone tears. Genevieve Gaignard’s site-specific installation, in which every detail speaks of her own biracial identity. 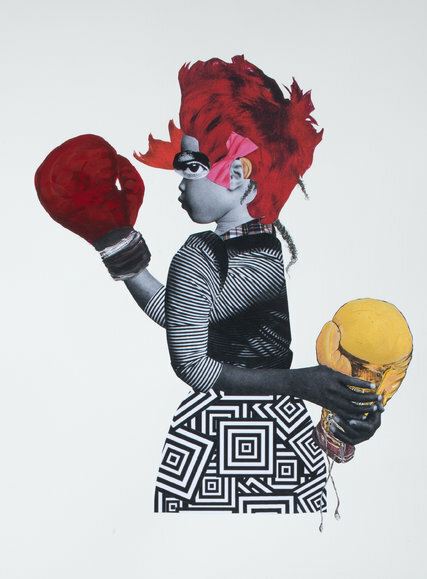 Deborah Roberts moves in a mixed-media direction in her small collages of combative female adult-children brandishing boxing gloves. 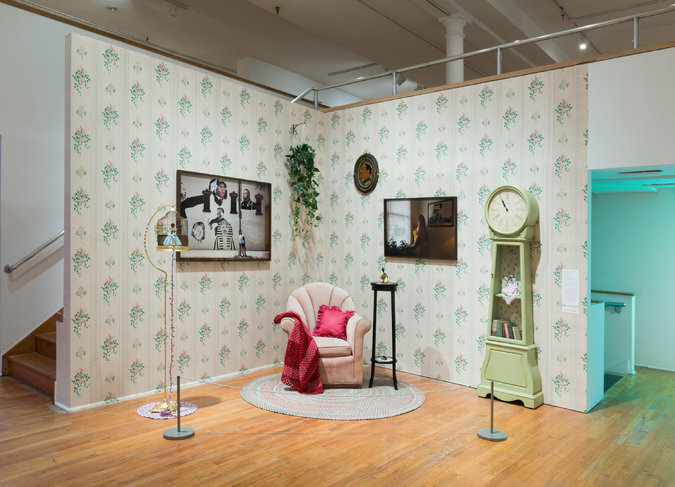 And Genevieve Gaignard goes further still in a full-scale installation of a grandmotherly living room, in which every detail speaks of her own biracial identity. Her piece is essentially a self-portrait. Another, by the artist Texas Isaiah, who describes himself as a “transmasculine femme boy,” is in the form of a single photograph. And a third, by Sherrill Roland, comes in several parts. Deborah Roberts’s “Rope-a-dope” (2017), a collage of adult-children brandishing boxing gloves. While in graduate school Mr. Roland was wrongfully convicted of four misdemeanors and jailed for 10 months. (The judge who had overseen his trial threw out the convictions, and court records were sealed.) Mr. Roland refuses to speak about the charges, but when he returned to school, he continued to wear a version of his orange prison jumpsuit as a way to spark discussions about racial profiling and incarceration. The jumpsuit hangs in the gallery, along with photographs and a video documenting his public conversations with fellow students and passers-by. Incarceration also has personal resonance for Sable Elyse Smith, whose father’s imprisonment has deeply affected her. In a complex body of work, only sampled here, Ms. Smith pulls the lens back from her own experience to a larger consideration: the burning social justice problem of the emotional trauma inflicted on both inmates and families. Other artists tackle specific issues too. Jazmin Urrea and Stephanie J. Williams both explore the racial politics of food, its distribution and its cultural associations. Krista Clark and Patrick Martinez, in very different ways, evoke the perils and beauties of gentrifying American cities. Sable Elyse Smith “7666 Nights– Falling,” a digital print, highlights the emotional trauma of incarceration on both inmates and families. Walter Price and Paul Stephen Benjamin play with idea of America itself as a symbol. In a fiery allegorical painting by Mr. Price, Old Glory appears to be losing its stars. An extravagant sound-and light installation by Mr. Benjamin called “God Bless America” incorporates a version of the Irving Berlin song as performed by Aretha Franklin at President Jimmy Carter’s 1977 inauguration, and a scathing riff on it by Lil Wayne, whose “God Bless Amerika” dates to 2013, the year after Trayvon Martin was killed. 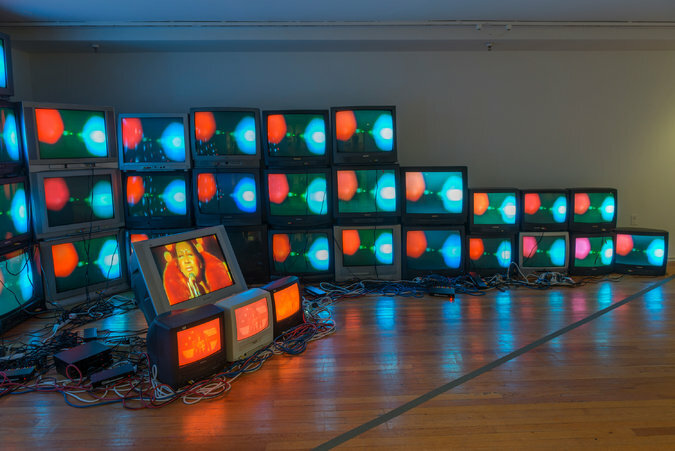 Paul Stephen Benjamin’s “God Bless America” installation incorporates the song performed by Aretha Franklin at President Jimmy Carter’s 1977 inauguration, and a scathing riff on it by Lil Wayne. Certain pieces in the exhibition — which has been organized by Connie H. Choi, an associate curator at the Studio Museum, and Hallie Ringle, an assistant curator — stand out for formal reasons. Nikita Gale and Michael Demps both unite sculpture and sound in ingenious ways: Ms. Gale’s work produces it; Mr. Demps’s work absorbs it. And some artists favor introspection over statement. An installation by the Kentucky-born Allison Janae Hamilton lyrically evokes the southern landscape she grew up with. Matthew Angelo Harrison’s casts of animal skulls and Maya Stovall’s ensemble of vessels made from broken glass found on the streets of Detroit suggest that preciousness and damage are inevitably intertwined. 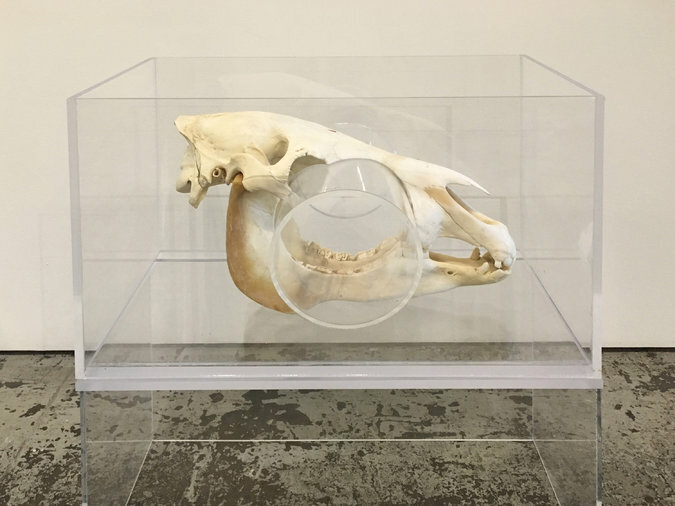 Matthew Angelo Harrison’s “Hole 1.005 The Consequence of Synthetic Apertures,” from 2016, with zebra skull. Although all the artists in the show are, technically, “emerging,” some have already arrived. Both Ms. Quarles and Ms. Smith can currently be seen in the exhibition “Trigger: Gender as Tool and as Weapon” at the New Museum (through Jan. 21. 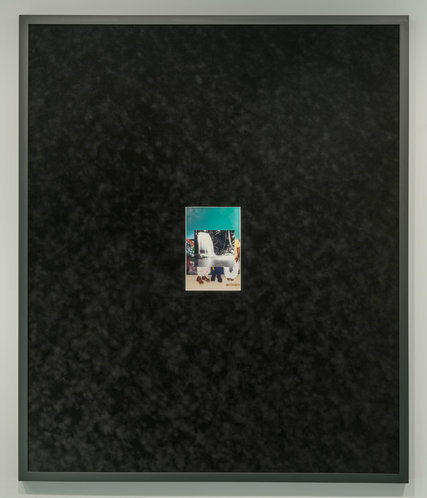 ), and Ms. Smith has a solo show at the Queens Museum, called “Ordinary Violence” (through Feb. 18). Last year, Ms. Gaignard had a terrific solo show at the California African American Museum in Los Angeles. Ms. Sherald has been commissioned to paint an official portrait of the former first lady Michelle Obama. No doubt there are profile changes in the cards for other artists in the show. And there are changes ahead for the Studio Museum. After “Fictions” ends, the museum will close its main headquarters at 144 West 125th Street to make way for a new David Adjaye-designed building, scheduled to open in 2021. In the interim, exhibitions and events will be distributed across multiple locations in the Harlem neighborhood. And the spreading of wealth has already begun. After you’ve seen “Fictions,” check out an accompanying show of the museum’s impressive trio of 2017 artists-in-residence (Autumn Knight, Julia Phillips and Andy Robert). And just a short walk away from the Studio Museum of Harlem, Derrick Adams’s jubilant collages in homage to the great African-American fashion designer Patrick Kelly (1954-1990) are at the Countee Cullen Library, at 104 West 136th Street. Fabulous. Through Jan. 15 at the Studio Museum in Harlem; 212-864-4500, studiomuseum.org.